This season is indeed a baby galore season for Nigerian entertainers especially comedians. Few weeks ago, we learnt about the pregnancy story of comedian AY’s wife, Mabel. As we speak another comedian’s wife has conceived. 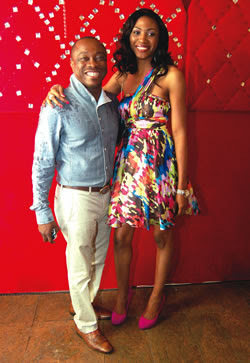 Ibiere Agwu who got married to Julius in 2008 is carrying the couple’s second child as the Lord will have it. She was recently spotted with a protruding belly and guess what.. she is now competing with Ay’s wife. Ay & Julius Agwu take their wives to the pool.